Simba, who was left behind when his family moved away, needs your help finding a new home and meeting his medical expenses. I remember the day like it was yesterday. Michelle, a nice lady who was buying her college age daughter books at the shop next to our Adoption Center, stopped in to talk. It was August 22, 2013. 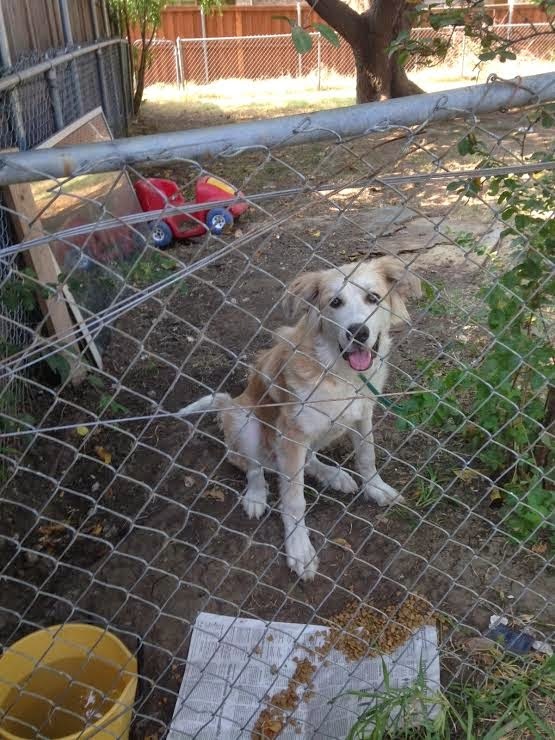 Michelle reported that a dog had been left in her neighbor’s back yard after the family had moved out. Michelle had been feeding him and providing water but it was hot and he was miserable and lonely. She was worried that “Simba”, named by the children who had lived in the home, was going to get bored and escape the yard and be injured somehow. She told us of his unusually large size and fluffy white sandy colored fur. 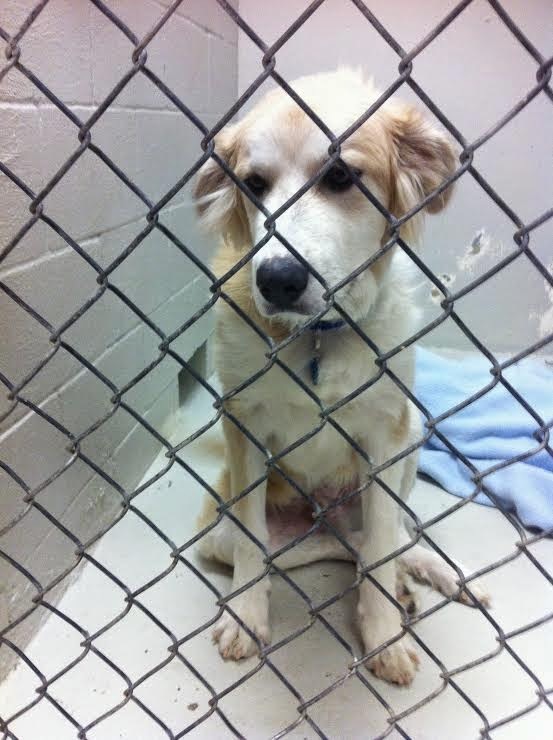 From her description and photo on her phone we could tell he was probably a Great Pyrenees mix… and beautiful. At only five months old Simba already weighs 70 pounds. The next day, Marlene (fellow rescuer), my son Andrew, and I swung into action and headed out to rescue Simba. We met at Michelle’s home and we followed her as she walked to the house next to hers. The house was visibly empty and a big For Sale sign had been placed in the front yard. The grass and bushes already seemed overgrown. Simba greeted us by swinging his big paws over the top of the chain link fence and rested them there so we could pat his big fluffy head. We could see a big container of water and dried kibble that had been scattered about. Michelle took us around the house to the side yard where we pushed open the gate. There were a few worn childrens’ toys strewn about the back yard and it almost looked like someone might still be coming back for them and for Simba… but we knew no one would be. 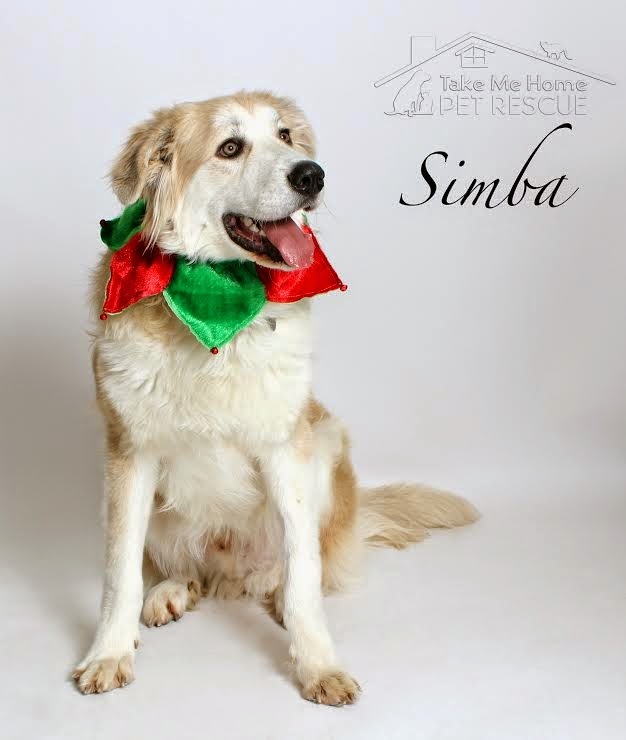 Simba greeted us with a tail wag and we easily placed the slip leash over his head and led him to my car where he eagerly jumped in with some assistance from Andrew as he boosted him in…. Simba’s first stop was at our vet’s office where we learned he was only 5 months old and already weighted 70 pounds. After he was examined, tested negative for heart worm and vaccinated, we brought him to the Adoption Center where he waited for his foster mom. 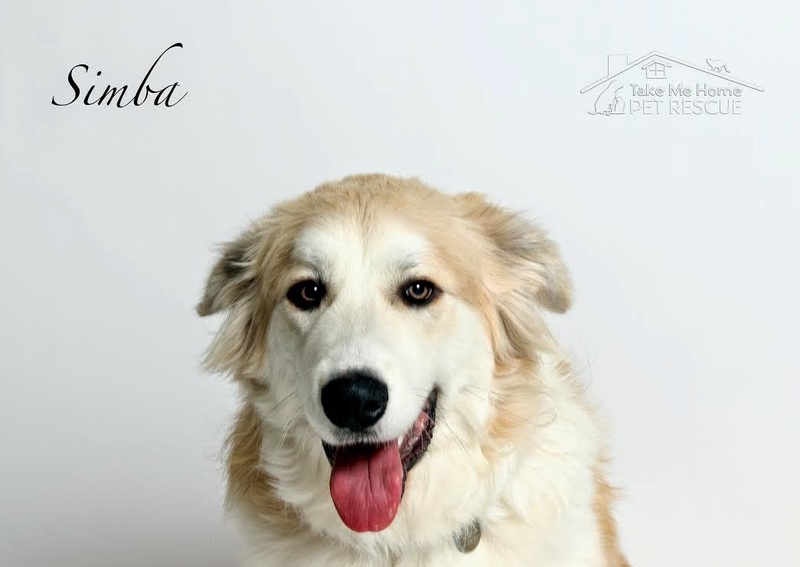 Sarah, a favorite TMHPR foster, had agreed to take him as she loves the Great Pyrenees breed and instantly felt a connection with Simba. At the Adoption Center waiting for his foster home. Because of Simba’s very large body size we decided to postpone his neuter surgery until he had time to grown into his feet. He was finally neutered in November and then placed up for adoption. In the mean time Simba learned about being an indoor dog and what it was like to sit on the coach and be a member of the family. He enjoyed the kids, cats and other dogs in the home – one large shepherd mix named Jenny, who was rescued off the golf course in Richardson where she had been dumped as a tiny pup, and Sammy, a small Shih Tzu mix who Sarah had rescued from the Garland shelter where she had been abandoned with a litter of puppies. Christmas came and went and an application finally came in that we felt was a good match. Sadly, though, it was not. 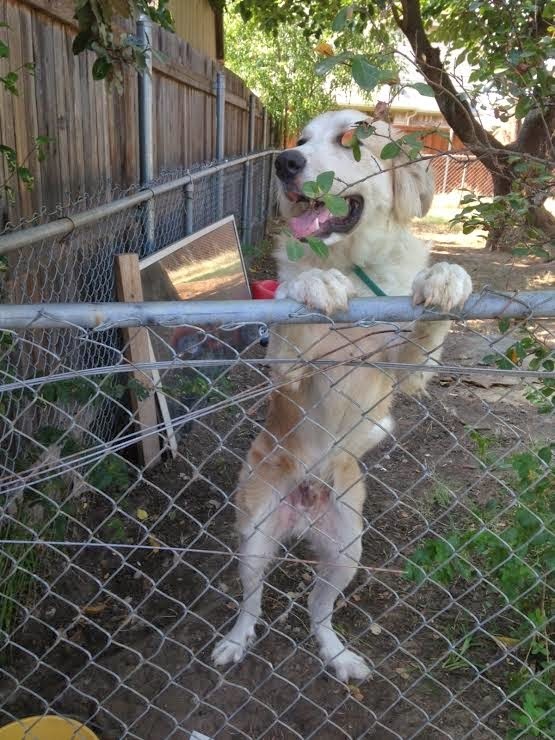 As it turned out the adopter had plans to make Simba a running partner and Great Pyrenees do not usually make good running dogs. They were bred to watch their flocks of sheep or goats and stand or sit for long periods. In just a few weeks after starting his intensive exercise regime Simba developed a limp in his front right leg and was returned to us. We don’t blame the adopter for what happened to Simba as we don’t believe her actions were intentional or in any way meant ill will towards him. Simba poses for his Christmas picture. 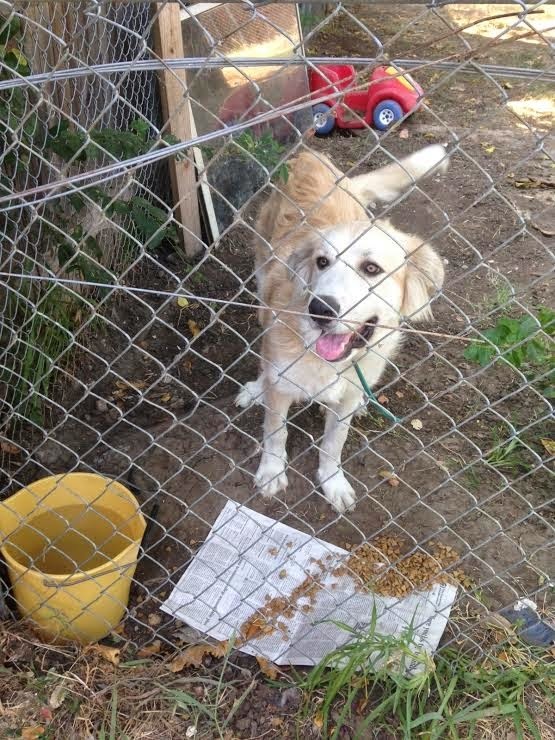 Simba went back to Sarah’s home where he was allowed to rest and recuperate. For the most part the limp disappeared and Simba has returned to his normal self… playing in the back yard with Jenny and Sammy and sleeping on the couch. He has recently been seen by two doctors at the Dallas Veterinary Surgical Center, DVSC, where we learned that Simba likely has a congenital problem in his shoulders which was exacerbated by intense activity. We have confirmed he is not a surgical candidate and will live a long happy life as long as he is not expected to run, jog or walk for long distances. Dr. Bayer even fell in love with Simba and mentioned how much he would love to adopt him if it wasn’t for the “grumpy old cat” he already had at home who might not take so well to a now 100 pound dog. 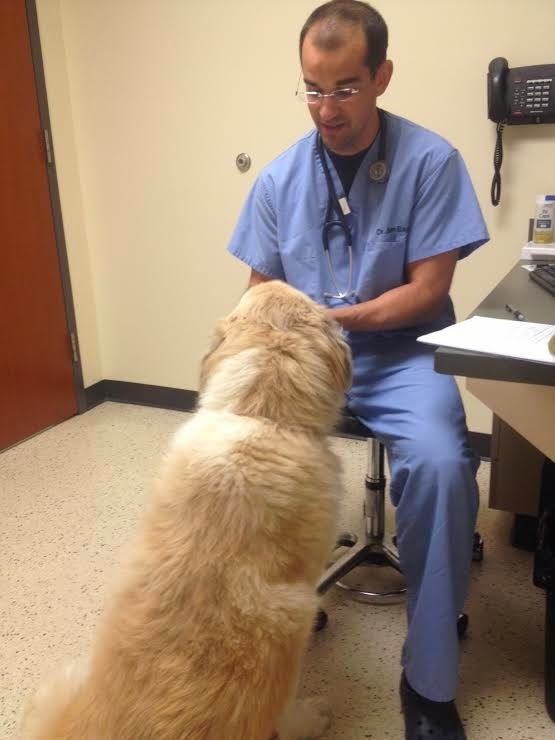 Dr. Bayer introduces himself to Simba. Ready for his forever home..
Now that surgery has been ruled out, Simba is back on the market and available for adoption. He is great with other dogs, older kids and cats. He is house, crate and leash trained. He is happy to be home with his foster family again and welcomes any applications where he is allowed to be himself although a large securely fenced yard and another playful dog sure would be nice!For adoption details please visit our website at www.takemehomepetrescue.com. We would be very grateful if you would consider helping us with Simba’s expenses. We never know when deployed what we are walking in to or what the ultimate price is that we will pay to rescue a life. In Simaba’s situation, the expenses ended up being very high. Because we are a nonprofit and rely on public support to help us keep going, we are asking for your help. We have created a fundraiser page for Simba. Please click HERE to help us continue making a difference in the lives of those who cannot speak for themselves. Thank you!